We're liveblogging Ford CEO Alan Mulally's IFA keynote at 11AM ET! Ford just made industry history by being the first major auto manufacturer to unveil a new model at CES, the Focus Electric. But we already knew it would. What we didn't know were the details of the thing, but now we have them. And a lot of pretty pictures. Ford is saying the car will manage a range of 100 miles and that it will offer an MPGe rating (a conceptual equivalency of miles per gallon for an electric or otherwise non-traditionally powered car) higher than the Volt and comparable to the Leaf, but crucially it's saying that it can be recharged on a 240 volt outlet in four hours or less. The Leaf can take up to seven hours with the same amount of current -- though of course CHAdeMO support there handily trumps that. More details below, along with details of some pretty blue butterflies. As you can see in the pictures the car looks quite good, inheriting the generally taut lines (if bulkier exterior) of the 2012 focus, but doing so with a bit more bling thanks to that grille up front. Also new is the fender-mounted charging plug, with an illuminated ring that fills up as the batteries do. Power is provided by a liquid-cooled (and heated) battery pack developed in conjunction with LG Chem and, while we don't have a curb weight yet, we're told to expect a car that handles just as nicely as standard Focus does -- which is rather nicely indeed, we might add. What we don't know, crucially, how much it will cost. That is an answer to be revealed sometime before its 2013 release. Or, at least, we hope it will. Update: Ford's wording on the release date is a bit vague, but it's looking like 2013 in Europe and late 2011 in the US for a Focus Electric release. DEARBORN, Mich., Jan. 7, 2011 – Ford Motor Company unveiled today its all-new Focus Electric – the company's first-ever all-electric passenger car. The zero-CO2-emissions, gasoline-free version of Ford's popular small car is the flagship of the company's growing fleet of hybrid, plug-in hybrid and all-electric vehicles coming to North America and Europe by 2013. "Focus Electric is the flagship of our new family of electrified vehicles, showcasing our commitment to offer consumers choice when it comes to fuel-efficient or fuel-free vehicles," said Derrick Kuzak, Ford group vice president for Global Product Development. "Its advanced powertrain will deliver significant energy efficiency advantages and zero CO2 emissions without compromising driving enjoyment. And its suite of smart driver information technologies will transform the way customers think about energy usage and their transportation needs." The sleek and stylish five-door hatchback leverages Ford's global C-car platform shared by the gasoline and diesel-powered Focus models, which debuted at the 2010 North American International Auto Show and were launched at the Paris Motor Show in September. Both Focus gasoline and electric variants to be sold in North America will be built at Ford's Michigan Assembly Plant in Wayne, Mich., with production powered in part by one of the largest solar energy generator systems in the state. Focus Electric is one of five new electrified vehicles included in Ford's electrification strategy. Initial deliveries of Transit Connect Electric began in North America at the end of last year and the vehicle will be launched in Europe later in 2011. Much of Focus Electric's steering, handling and braking feel is shared with the agile, sporty, fuel-powered Focus models upon which it's based, making Focus Electric a dynamic driver's car. At the same time, the absence of a gasoline or diesel engine and outstanding aerodynamics lead to a remarkably quiet, comfortable in-car experience. "More than any other electric vehicle on the market, Focus Electric loses none of the dynamics and quality of driving a traditional car," said Sherif Marakby, director of Ford's electrification programs and engineering. "It shares many of the same premium components and features as its gasoline-powered counterpart, while delivering distinct efficiencies and a uniquely exciting driving experience." Future owners of the Focus Electric will likely recharge the car's advanced, Ford-engineered lithium-ion battery pack at home on a daily basis, using the recommended 240-volt wall-mounted charge station that will be sold separately or the 120-volt convenience cord that comes with the vehicle. "We're very excited about the potential of Focus Electric in the marketplace. With so many of us accustomed to recharging mobile electronics on a daily basis, we're confident our customers will take to the vehicle recharging process just as easily, because that's exactly what it is – easy," said Nancy Gioia, Ford director of Global Electrification. "Not only have we made the practice of plugging in simple and straightforward, we're working with leading technology companies and the utility industry to make the EV experience empowering and engaging." Among these tools is a unique execution of MyFord Touch driver connect technology. Thoughtfully developed for electric vehicle owners, it offers innovative presentation of vehicle information, such as battery state of charge, distance to charge point, the corresponding range budget and expected range margin. The system's MyView feature allows drivers to access even more vehicle data including the electrical demands of vehicle accessories such as air conditioning, which can impact driving range. Just as the growing leafy vine of first-generation SmartGauge™ with EcoGuide represents fuel efficiency in the Ford Fusion Hybrid, the cluster display in Focus Electric uses blue butterflies to represent the surplus range beyond one's charge point destination – the more butterflies there are, the greater the range. Ford designers were inspired by the phenomenon known as "the butterfly effect," in which a small change, like choosing to drive an electric vehicle, can have an enormous impact. To reinforce the message, at the end of each trip a display screen provides distance driven, miles gained through regenerative braking, energy consumed and a comparative gasoline savings achieved by driving electric. 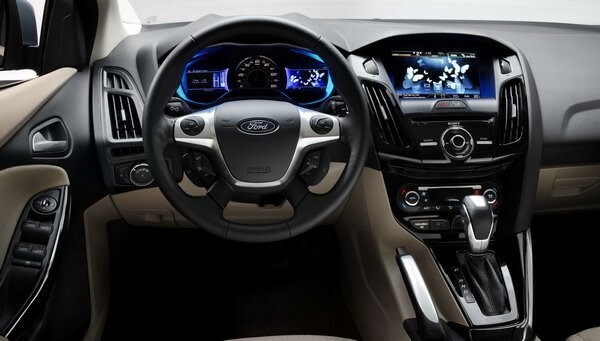 The cluster is also integrated with the MyFord Touch map-based Navigation System using the vehicle's center stack 8-inch touch screen. After adding their driving destinations, including their next charge point, into the vehicle's Navigation System, the vehicle will coach drivers on how to achieve the desired range – or if travel plans need to be adjusted. The on-board Navigation System provides an EcoRoute option based on characteristics of efficient EV driving. Working with MapQuest®, MyFord Mobile can communicate charge station and other points of interest to Focus Electric using SYNC's Traffic, Directions and Information (TDI). Turn-by-turn guidance is provided by the in-car map-based Navigation System. Drivers can also get up-to-date charging station information in their vehicle directly through SYNC TDI simply by connecting to SYNC Services. Focus Electric owners are likely to handle one of the vehicle's charge cord connectors two or more times each day. That's why Ford worked with supplier Yazaki to provide an industry-standard five-point plug that is ergonomically comfortable to hold as well as durably and distinctively designed. When the cord set connector is plugged into the vehicle's charge port, which is conveniently located between the driver's door and front wheel well, it activates a light ring that loops around the port twice in acknowledgement of connectivity. The light ring then illuminates in quadrants as the vehicle charges. Flashing quadrants represent charge in progress and solid-lit quadrants show stages of charge completion. In the unlikely event of a fault, the entire ring will flash. When the entire ring is solidly lit, the vehicle is fully charged. The active liquid system heats or chills a coolant before pumping it through the battery cooling system. This loop regulates temperature throughout the system against external conditions. On hot days, chilled liquid absorbs heat from the batteries, dispersing it through a radiator before pumping it through the chiller again. On cold days, heated liquid warms the batteries, gradually bringing the system's temperature to a level that allows it to efficiently accept charge energy and provide enough discharge power for expected vehicle performance. "Focus Electric is the culmination of years of research and development," said Kuzak. "More importantly, it's the start of an exciting new era for Ford and our customers." Ford Motor Company, a global automotive industry leader based in Dearborn, Mich., manufactures or distributes automobiles across six continents. With about 163,000 employees and about 70 plants worldwide, the company's automotive brands include Ford and Lincoln. The company provides financial services through Ford Motor Credit Company. For more information regarding Ford's products, please visit www.ford.com.